This Brown Sugar Salmon recipe is so simple yet so delicious! Start with a salmon marinade with brown sugar, soy sauce, and bourbon to add lots of flavor. After marinating, glazing, and baking, you'll have the perfect brown sugar glazed salmon that everyone is sure to love! Combine all ingredients except the Pecans and Salmon in a bowl. Place Half the marinade and the Salmon in a Ziploc bag - squeeze out the air and zip the bag tightly. Set aside the other half of the marinade to use as a glaze. Marinate the Salmon for 1-3 hours. Flip the bag every 1/2 hour or so to marinate evenly. Place the remaining half of the marinade in a small saucepan on the stove. Bring to a boil, then reduce the temperature to low and simmer until the mixture thickens and reduces a little. While the glaze is simmering, preheat the oven to 400 degrees. Place the chopped pecans on a flat baking pan which has been covered with aluminum foil or parchment paper. Toast the pecan for 3-5 minutes until they darken a little and they start to smell sooo good. Watch closely - the nuts can burn quickly! Cover a baking dish or pan with aluminum foil. Spray the foil-covered pan with cooking spray. 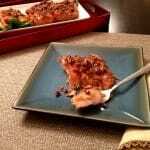 Take the Salmon out of the marinade and discard the marinade. Place the Salmon (skin-side down) on the prepared pan. Sprinkle the salmon with the toasted pecans pressing the pecans firmly into the salmon. Brush or spoon 1/3 of the glaze onto the salmon. Place the salmon in the oven. Re-glaze the salmon with the glaze every 8-10 minutes (about 3 times). Bake at 400 degrees for a total of 20-25 minutes until the salmon flakes easily.